Derry midfielder Fergal Doherty has announed his retirement from the inter-county game. Derry midfielder Fergal Doherty said it has been a privilege to wear the Derry jersey after announcing his retirement from the inter-county game. The Bellaghy star has endured a difficult run with injuries over recent season but remained one of the top performers in the county. 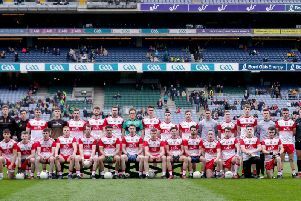 “Unfortunately, due to ongoing work commitments and recurring injuries, I have had to call time on my inter-county career with Derry,” explained the Oak Leaf player. “It has been a privilege and an honour to wear the red and white jersey representing our county. I have enjoyed my time playing inter-county football and it’s something that I will miss. However, I feel the time is now right to make this call. The new Derry boss said Doherty would be a loss to the county team but wished him well for the future. “Fergal was a player with great presence and great temperament. He was a leader who commanded respect,” explained Barton. “Fergal was one of the few players who could catch the ball at a great height and then hit the ground running. A county Board statement described the midfielder as a ‘legend’ of Oak Leaf football. “We regard Fergal as a living legend of Derry football and behalf of all members and supporters of Derry GAA, we sincerely thank him for his efforts throughout many years. He is, without doubt, one of the greatest players to have represented our county in any code and he will be sorely missed.